This publication is in the INCUBATOR section. Roland Schäfer (in preparation) Statistische Inferenz in der Linguistik. To be submitted to Language Science Press when it’s done. English version planned to be written after the German version. The Git repository is here (Roland Schäfer Statistical Inference in Linguistics Git repository), but there isn’t much going on at the moment. It’s still an empty document mostly. Dieses Buch führt Linguist*innen in die Prinzipien statistischer Inferenz für korpusbasierte und experimentelle empirische Arbeit ein. Statt rezeptartige Einführungen in einzelner Tests und Modellierungsverfahren anzubieten und damit die gedankenlose Anwendung statistischer Methoden zu fördern, argumentiere ich für einen gezielt probativen Ansatz (im Sinne von Deborah Mayos [2018 und vorausgehend] Konzept des Severe Testings). Unter dem probativen Schirm können Fishersche und Neyman-Pearsonsche (N-P) Tests mit der richtigen (ggf. bescheidenen) Interpretation eingesetzt werden. Eine scharfe Trennung in Fisher oder N-P ist nicht erforderlich und nicht zielführend, und Bayesische Ansätze werden als nicht angemessen abgelehnt. Die grundlegenden Unterschiede zwischen den frequentistischen Traditionen (Fisher und N-P), Likelihoodismus, Bayeisanismus und Mayo’s Probativismus werden diskutiert, aber – da ich kein Wissenschaftsphilosoph bin – soll diese Diskussion nur als Anregung dienen, die einschlägigen Werke (insbesondere Mayo) im Original zu lesen. Einige populäre statistische Tests (Fisher, Barnard, χ², Binomial, z, t, U, ANOVA mit Erweiterungen, H) werden eingeführt. Die Fischersche und die N-P-Interpretation (mit prä-experimenteller Teststärke) aller Tests wird erklärt, ebenso wie die Testung der Voraussetzungen für die Tests. Des weiteren werden lineare Modelle und ihre verschiedenen Ausbaustufen (bis hin zu hierarchischen generalisierten linearen Modellen) vorgestellt. Anders als in anderen Einführungen werden Leser*innen allerdings dazu eingeladen, nicht einfach nur die Verfahren zu rechnen, sondern sie (soweit für Nicht-Statistiker*innen möglich) zu verstehen. In diesem Rahmen wird Stefan Gries’ Modeling Everything Approach (MEA) kritisch bewertet. Das Buch enthält aus Überzeugung keine Einführung in eine bestimmte Statistik-Software, zumal “praktische” Einführungen ohnehin bereits den Markt überflutet haben, und weil durch auf die schnelle Anwendung ausgerichtete Bücher die toxischen Fehlinterpretationen statistischer Ergebnisse nur weiter fördern. 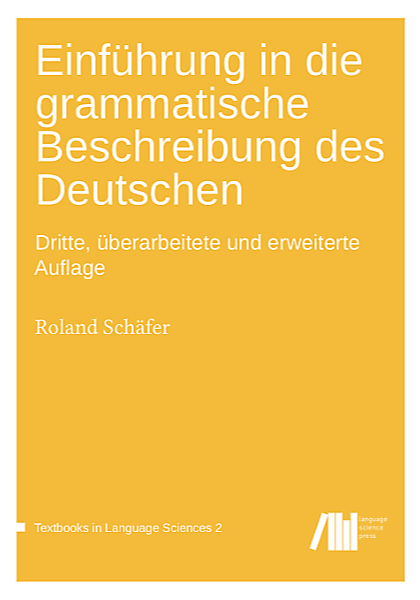 Das Buch erscheint zuerst in Deutsch, dann in Englisch. 66In this book, linguists are introduced to the basics of statistical inference for corpus-based and experimental work. Instead of presenting recipe-like introductions to single methods and furthering mechanical application of simple statistical tests, I argue for careful empirical work under a probative approach (following Deborah Mayo’s work on her concept of Severe Testing; Mayo 2018), as part of which Fisherian and Neyman-Pearson (N-P) tests can be used under appropriate circumstances and with the right (modest) interpretation. The differences between classical frequentist frameworks (Fisher and N-P), Likelihoodism, Bayesianism, and Mayo’s Probativism are briefly discussed, but – since I am not a philosopher of science and statistics and do not intend pretending to be one – mostly in order to encourage readers to dig deeper and read Mayo’s works. Standard statistical tests used in linguistics are introduced (such as Fisher, Barnard, χ², Binomial, z, t, U, ANOVA with extensions, H) including pre-experiment power calculations and thorough checking of the tests’ assumptions. Furthermore, linear models, generalised linear models, and their multilevel generalisations are introduced. However, instead of just teaching readers to simply run the tests in some statistics software, they are encouraged to think about the tests and the (usually limited) inferences they warrant. Also, what I call Stefan Gries’ Modeling Everything Approach (MEA) to multilevel modeling is critically evaluated. There is no introduction to any specific statistics software in the book, especially as such hands-on textbooks for linguistics have already flooded the market, and because they further the toxic recipe-like application of statistical methods without thinking. A series of Creative Commons-licenced videos will be created (and made available on streaming platforms), which show how to work with the methods discussed in the book in R and RStudio. The book will be licensed under a Creative-Commons license and will be submitted to Language Science Press (series Textbooks in Language Sciences). I intend to insist on an open review process. The book is written in Xelatex, R, and knitr using RStudio Server installed at webcorpora.org as an IDE. Since my views on statistical thinking were changed significantly several times over the past five years, I had to restart from scratch several times. Consequently, I will not be able to finish my book before late 2019. This project was previously called Modellierung grammatischer Alternationen and planned to be first written in German (and later in English). Another title I considered for some time was Statistical Modelling in Linguistics. The scope has widened, and it is now written in English first. Also, the title now reflects the more holistic approach to statistical inference. If it is a success, a German translation will be published.